← Where did all that pain go, Jimmy? Why does it weigh so much? The plastic gloves filled with popcorn with a ring on one finger hanging from the fireplace was the sign that I was in the right place. So all I can say is THANK YOU to Cindy Dauscher and the other members of the book club that meets monthly in the Nazareth, Pa. area. And I hate to pull a Sally Fields here, but you really liked it, the book, that is, “The Swamps of Jersey,” the first Frank Nagler mystery. These woman read the book carefully, came to the meeting with notes and questions and a list of characters … and Cindy even said the buffet was like eating at Barry’s, the coffee shop where Detective Frank Nagler and reporter Jimmy Dawson hang out. I was questioned repeatedly about why such a character did this or that, how the story was developed, details of what was the source of information used in the story, and what was the inspiration for shopworn Ironton, N.J., the setting for the book. It was gratifying to hear them react to Frank Nagler, the central character. He is presented at a grumpy, lonely middle-aged man who was once the most famous cop in Ironton, a stature he disliked. The lofty statue resulted from Nagler’s efforts to capture serial killer Charlie Adams. But as Nagler said often it was also the work of Detective Chris Foley who helped capture Adams. What I appreciated was that they questioned Foley actions and motives in “Swamps” right from the start, seeing the tension that was established when the two men met at 3 a.m. in the rain in the Old Iron Bog to investigate the opening crime of the story. They didn’t like Chris Foley, and know what, you’re not supposed to. I was pleased to see that they liked reporter Jimmy Dawson, Nagler’s long time friend and nemesis, and who acts as an in-story commentator, and especially Bartholomew Harrington. Bart was a character of necessity. I needed someone to carry the subplot of economic desperation seen in Ironton. Bart became a fun, larger-than-life addition. When I presented them with copies of the second book in the series, “A Game Called Dead,” they demanded to know if Lauren Fox reappeared. Lauren is Nagler’s girlfriend. In “Swamps” she lingers at the edge of the story. They weren’t happy when I told them that she was as much a plot devise as a character, but they appreciated that it was Jimmy Dawson who tells Nagler to “go find her.” And they were happy that the end of the book presented the chance that Frank and Lauren would get together. But it was the popcorn hand that was the topper. The plot in “Swamps” is complicated and at times deliberately murky. I wanted readers to follow Nagler’s thought and processes as he investigates. But one has to drop some hints. The discovery of the hand in the bog by police divers is one such moment. I’m glad that moment stuck in their minds. I don’t write this to say, hey look at me. It’s written from the perspective that writers don’t often get such detailed, important feedback from readers, especially in person. I am gratified they took such care reading the book, and yes, it is some validation of my attempt to write a story with solid characters and other trappings. Writers try to create an emotional and intellectual hook for readers. The book club members in this case told me it worked. THANK YOU. “The Swamps of Jersey” was published in 2014 by Imzadi Publishing. 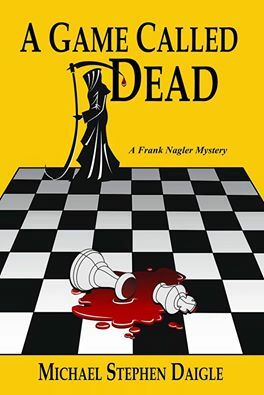 The sequel “A Game Called Dead” was published in 2016. The books are also available at the at the following libraries: Morris County Library; Somerset County Library System; Bernardsville Public Library; Hunterdon County Public Library; Parsippany-Troy Hills Public Library; Mount Olive Public Library; Phillipsburg; Warren County, Franklin branch; Mount Arlington; Wharton; Dover; Hackettstown; Clark, and the Ramsey library, as part of the Bergen County Cooperative Library System. This entry was posted in Fiction, Hot in Hunterdon; Georjean Trinkle, http://www.sallyember.com, Imzadi Publishing LLC, Michael Stephen Daigle, Mystery Writers of America, www.michaelstephendaigle.com and tagged "A Game Called Dead", "The Swamps of Jersey" Imzadi Publishing, fiction; politics. Bookmark the permalink.